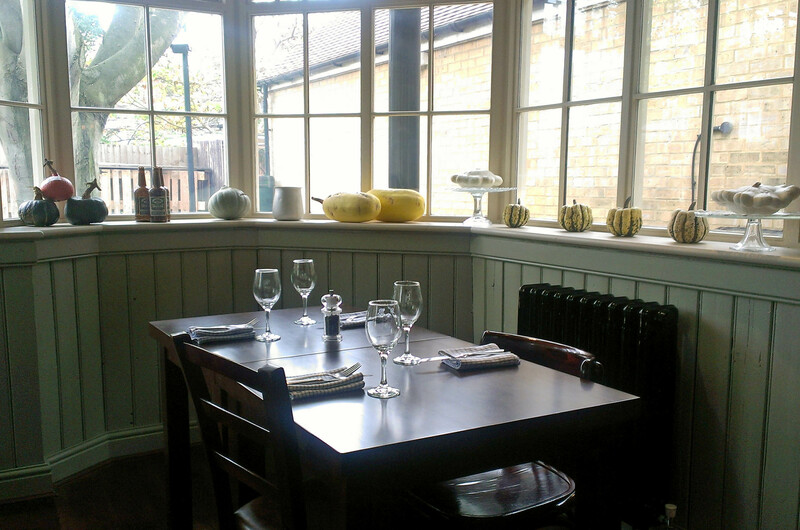 Like all the food-related bloggers in and around Oxford, it was only a matter of time before I reviewed Jacobs Inn (130 Godstow Road, Wolvercote, OX2 8PG), the new(ish – they opened in July) dining room and public house by the people who brought you Jacobs and Field. I had been looking forward to the day with great anticipation. The Baberoo, her Gran and I visited the restaurant for a weekday lunch, having booked the day before, and boy was I glad we had. It was jam-packed in there; the Jacobs Inn guys do a great job at PR and they have an almost cult-like following already. They even have a Twitter account for their chickens (@jacobschickens), which they keep in the back garden along with their pigs. Talk about locally-sourced eating! 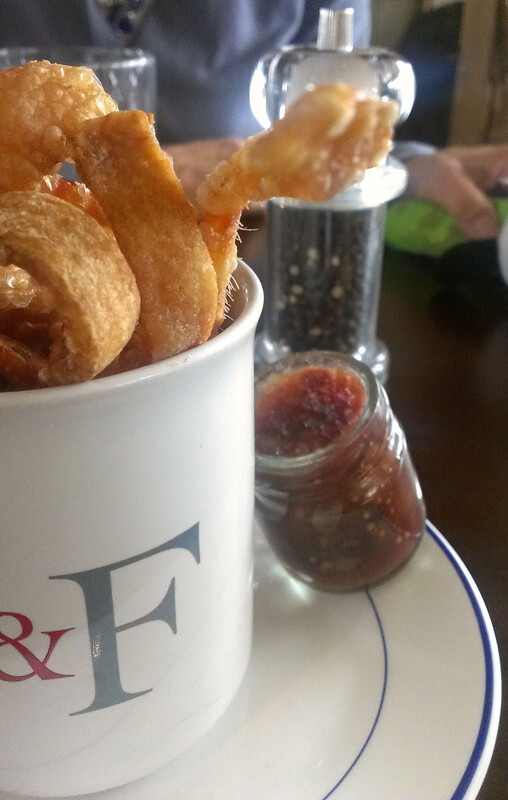 To tide us over before our lunch arrived I ordered some pork crackling with apple relish (£3.50). The apple relish was delicious, but the crackling had been overdone to a hardness that was no longer edible – really too bad, since I had been hoping for a crispy treat. It was hard to decide on my main, given all the delicious-sounding meats on the menu. 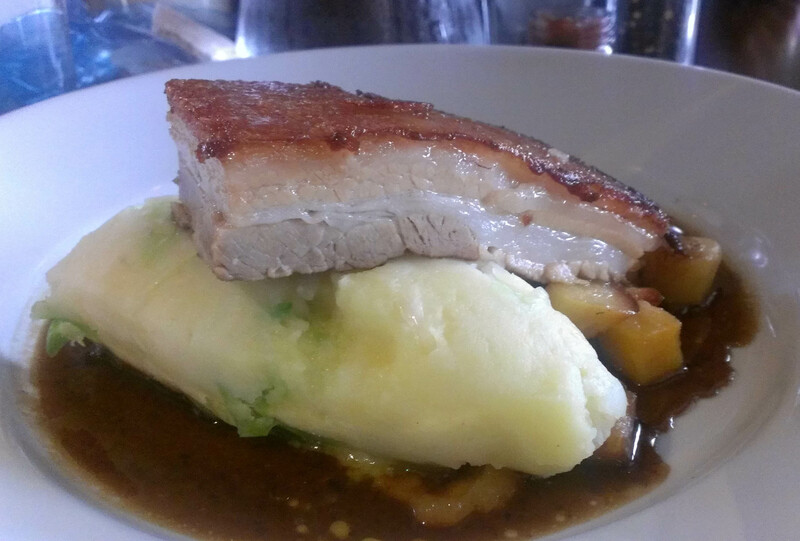 The venison and bacon ragu sounded tempting, but in the end I went with the Blythburg free range pork belly (£13). It was tender and succulent, with a lovely, almost jammy, seared exterior. I offered some to the Baberoo – big mistake, because she liked it so much that she clamoured for more and ended up eating half of it! Despite the pork cracklings not turning out well, I enjoyed the meal and the relaxed atmosphere, and would certainly go back to Jacobs Inn. So, how did it fare on the baby-friendliness scale? My ratings system (explained fully on my About page) encompasses five criteria: menu, space, ambiance, facilities, and feeding. Menu: For a restaurant that revolves mainly around meat, Jacobs Inn has a surprising number of dishes that can be eaten with one hand while you hold a baby in the other arm. Although the big cuts of meat that require both knife and fork aren’t a possibility, a pie, pasta dish, stew, and lots of starter and brunch plates are easily enjoyed one-handed. Space: The restaurant area is in the back of the inn, easily accessible with a pushchair (although we didn’t have one on the day since we came in a car). There’s not too much room between tables, so groups of parents with babies in carriages might have a hard time, although there were a few nooks and crannies in the dining room where more than one pushchair might fit, if you can get it through a somewhat narrow space in the middle of the restaurant area. Jacobs Inn also has parking – always handy if you have a car and would prefer to make the trip out to Wolvercote without braving public transport, although the number 6 bus does go right by the inn. But be warned: the parking lot can be a pretty tight squeeze, as we learned on our way out (no thanks to the obstinate lady in a Porsche). 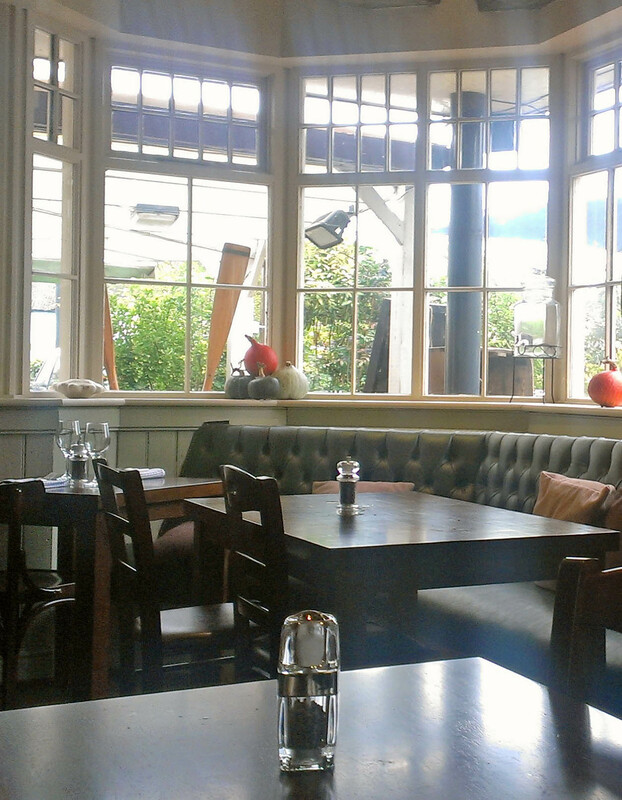 Ambiance: Quintessential laid-back gastropub, complete with roaring fire. It’s a beautiful interior. Staff were very friendly and helpful with the Baberoo. We were offered a high chair immediately and shown the way to the facilities when we needed them. Staff didn’t even blink at the amount of food that the Baberoo threw on the nice cowhide rug underneath our table and told me to leave the mess for them to clean up (I did clean it myself, though – who wants to pick up half-eaten cucumber and muffin?) The Baberoo also received lots of attention from a nearby table of friendly lunching ladies, which tickled us no end. 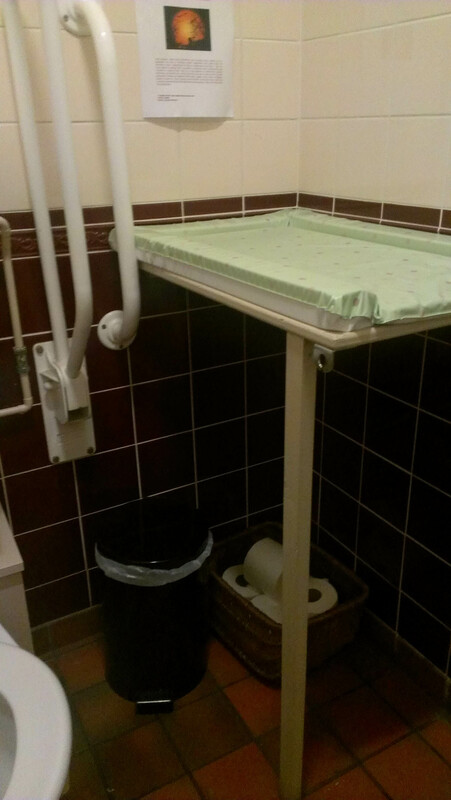 Facilities: The baby-changing table at Jacobs Inn is somewhat of a puzzler. It’s a wooden shelf that folds down from the wall and has one leg supporting it. It’s easy to accidentally kick the leg and dislodge it (which I did), and although I could see that the table had supports at the wall, I was still nonplussed at the idea that the leg could be so out of place. I knew the table wasn’t going to fall, but it still didn’t inspire confidence. Otherwise, the bathroom was clean and fresh-smelling and had enough room for a pushchair to fit comfortably. No shelf or area to put your changing bag, though. Feeding: The Baberoo ate a lunch brought from home (along with half of my pork belly); our table was on the small side so if you’re planning on seating your baby in a high chair and feeding them, see if you can get a table with enough surface area for the baby’s lunch (which always turns out to take up twice as much space as you think it will). If you’re breastfeeding, there are some tables with soft bench seating that might be more comfortable than the wooden chairs. By my ratings scale, Jacobs Inn earns a 7.5 out of 10 for baby-friendliness. It’s best to reserve a table, even for a weekday lunch. Go and relax by the fire and remember not to let your baby eat half your meal.